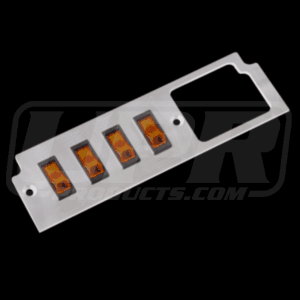 Innovative Bold Styling: UPR now offers you a great way to mount switches without cluttering up your dash with their all new Billet Ashtray Switch Plate for your 1987-1993 Ford Mustang. Quality Construction: Made from Billet Aluminum to cover the ashtray but still allowing the use of the cigarette lighter, while giving you the bold clean styling of our Aftermarket Dress Ups, Suspension and Performance Parts for your American Muscle Car! Installs in 10 minutes with normal hand tools. Fits these Vehicles: 1987 1988 1989 1990 1991 1992 1993 GT GTS Mustang Cobra Roush Saleen & Steeda Vehicles. Made in the USA!